Perma Master Fix is a specially developed polymer based adhesive for fixing various building products to concrete, mortar or wooden surfaces. Perma Master Fix develops high early and ultimate strengths. It is as nail free construction adhesive. Perma Master Fix is used for installation of door and window granite frames, marble sills etc,. Master Fix is ideal for fixing tiles on concrete and replacing the broken tiles. It is also used in fixing kitchen platforms, sanitary fittings, decorative tiles, general fittings and fixtures on concrete and plastered surfaces. Because of its psychotropic nature the product is successful used in vertical, horizontal as well as in over-head applications. 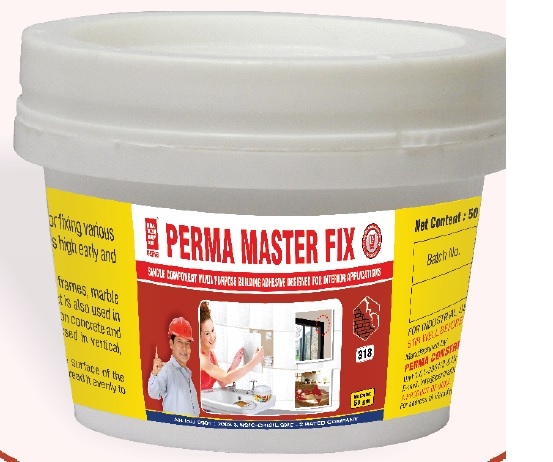 Perma Master Fix is suitable for fixing on concrete or plastered surfaces, card board, plastics, leather, fibre glass, ceramic tiles, wooden objects, marble, natural stones, aluminum composite panels and metals for interior applications. Packing : Perma Master Fix is available in 50gms, 150gms, 350gms,1kg pails and 400 gms cartridge packing, apart from bulk, on special request.